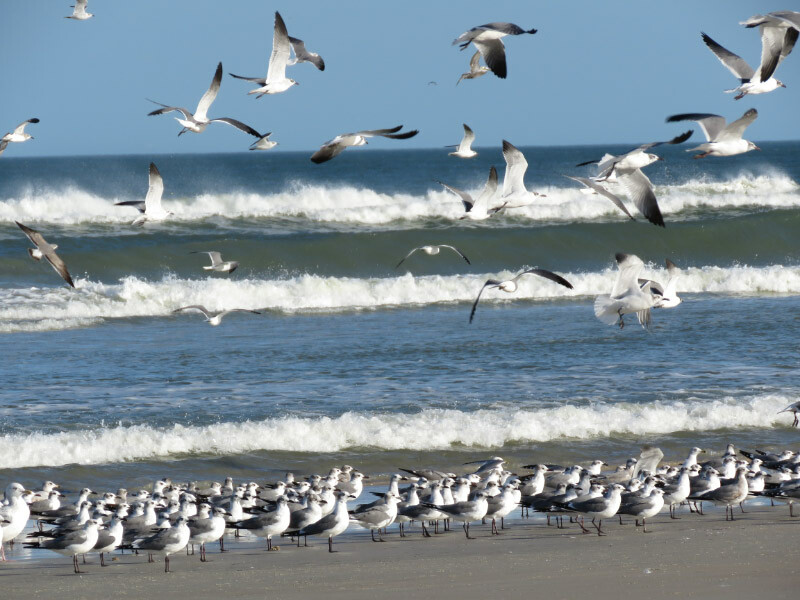 The rain was over by mid-day and by midafternoon we headed out to our second activity of our day at the Space Coast Birding and Wildlife Festival: a gull fly-in at Daytona Beach Shores. We met at the Frank Reardon Park and headed down the wooden steps to the beach. 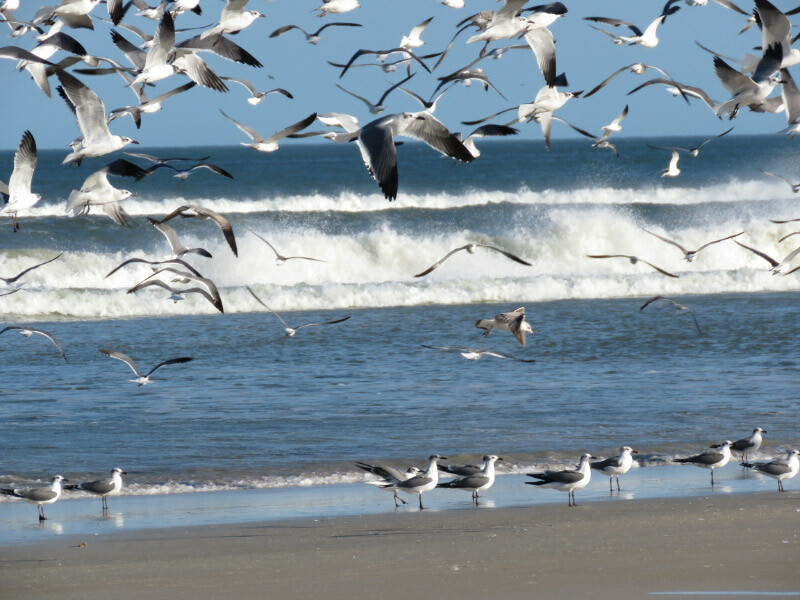 There were already a lot of gulls collecting on the wetter part of the beach. 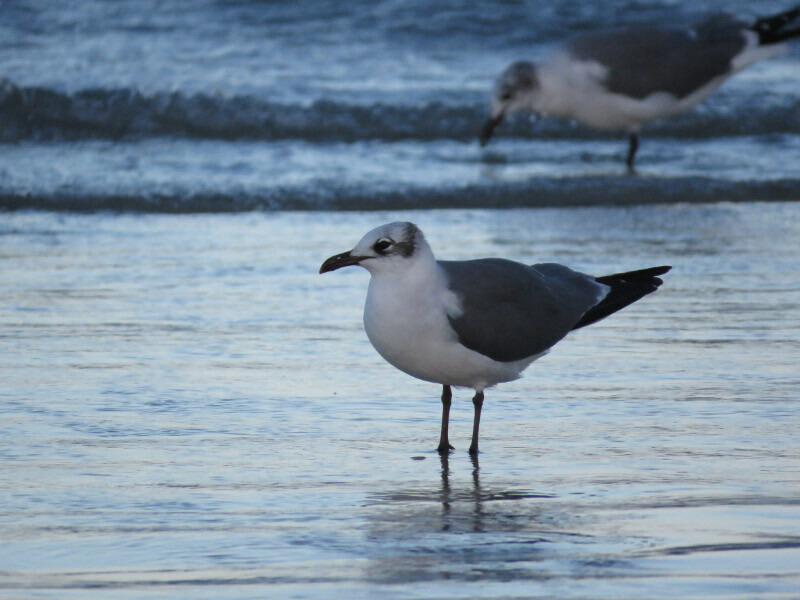 Laughing gulls (head in winter is a blurry gray rather than black as it is in summer, legs are reddish black or black). In the picture below there is a juvenile ring-billed gull behind the laughing gulls. Note that the ring billed gull is larger. Herring gulls (white head, yellow eyes, dull pink legs, juveniles are mottled brown). 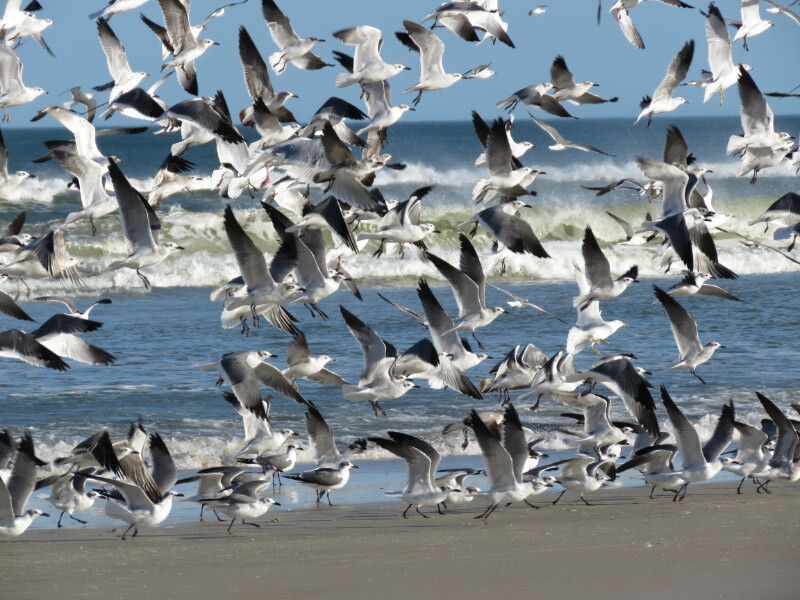 The herring gull is toward the back in the picture below with laughing gulls in the foreground. 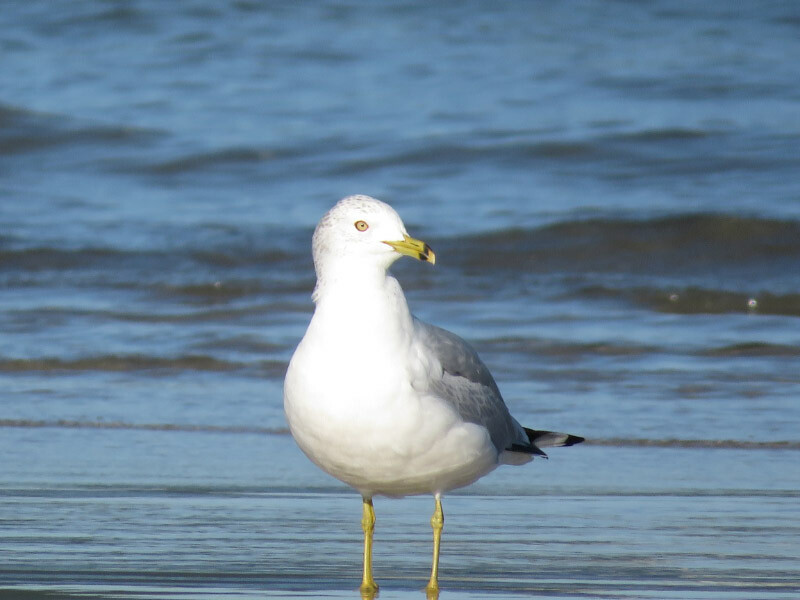 Note that the Herring Gull is larger than then laughing gulls (and the ring-billed gulls). All the birds were preening after spending the day feeding at the landfill. 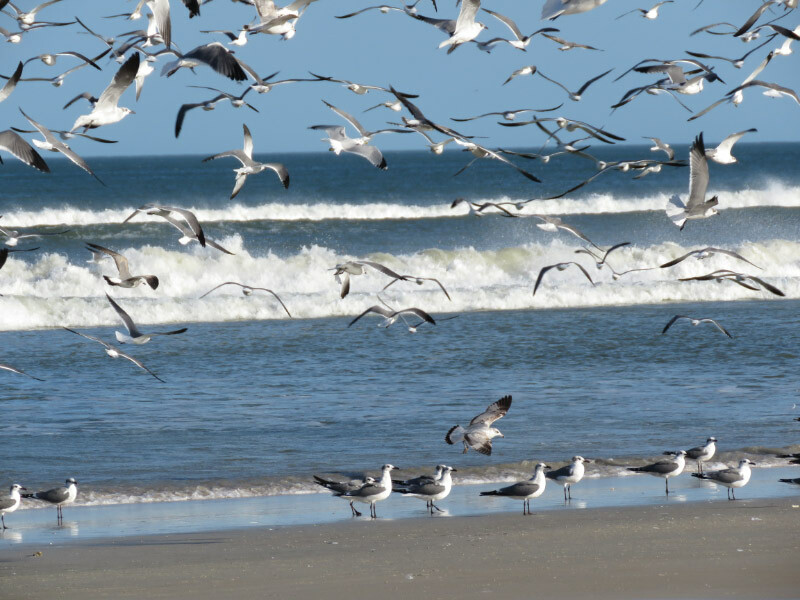 They gather at the beach in large numbers late in the day to rest and clean up before heading out to sea for the night. 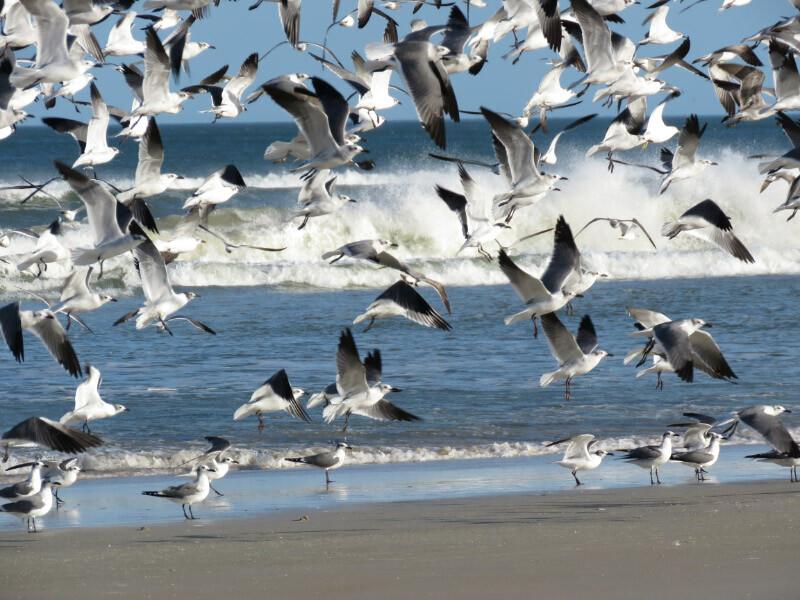 There was a peregrine falcon that swooped down from one of the high-rise resorts on the beach periodically – causing the gulls to fly up in a cloud. I got a sequence of shots of one such event. In the distance – close to the horizon – a parasitic jaeger was making dives and swoops going after gulls in the water. There were also pelicans that flew by. I stayed focused on the gulls as the light began to fade. I got a portrait of a laughing gull in the water. The sky began to reflect the sunset colors and it was time to call it a day.